To set up User ID's, go to System Maintenance > User ID/Security Setup. First, set up Security Levels if you have not already done so. 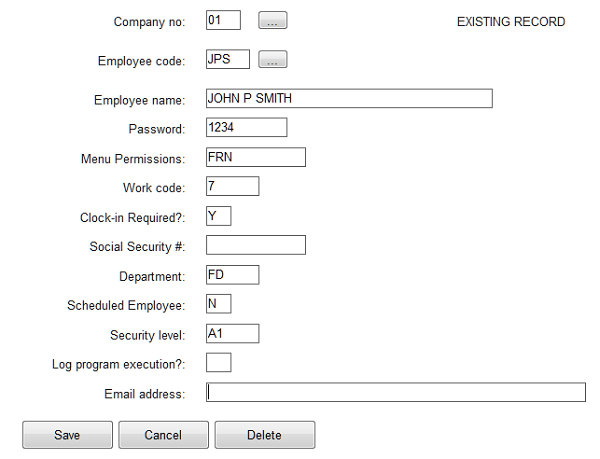 Then go to Set up Employee Records from the User ID/Security Setup menu. "Company no:" Enter the two-digit company for this User ID. Enter ** for all companies. Your system administrator should have ** company access as well as managers at your discretion. "Employee code:" Enter up to four characters. Typical is the employee's initials. If you are using Time and Attendance, use only three characters. "Employee name:" Enter the employee's name, up to 30 characters. "Password:" Enter a password, up to 8 characters. Note that the user cannot change his/her own password unless that employee has permission to this screen. If you are using employee login cards, this is where you swipe the card to encrypt the password and encode the card. "Work code:" If you are not using Time and Attendance, leave this field blank. If you are using Time and Attendance, enter a valid work code as set up in Time & Attendance > Work code setup. "Clock-in Required:" If you are not using Time and Attendance, leave this field blank. If you are using Time and Attendance, type Y if the employee must clock in, and type N if the user is not required to clock in. "Social Security #:" Leave this field blank. "Department:" If you are not using Time and Attendance, leave this field blank. If you are using Time and Attendance, enter a valid department code as set up in User ID/Security Setup > Set up Department Records. "Scheduled Employee:" leave this blank unless you are using Employee Scheduling. "Log program execution?" Leave this field blank unless advised by Execu/Tech. "Email address:" Enter the employee's email address. This field is required if you use Inventory Control with "purchase order authorization" set.